Opportunity to customize & finish renovation of retro 1950s mid century home overlooking Hudson River, featuring clean, crisp lines & high ceilings w/5 huge transom windows that create an abundance of light. Chic period details include: exotic cherry & teak woodwork, beamed ceiling, built-in shelving, concrete floors & a very large wood burning fplc in great rm & 2nd fplc in walkout family rm on lower level w/access to large wooded yard, covered patio & greenhouse. Much room for pool & expansion. All glass facing river. 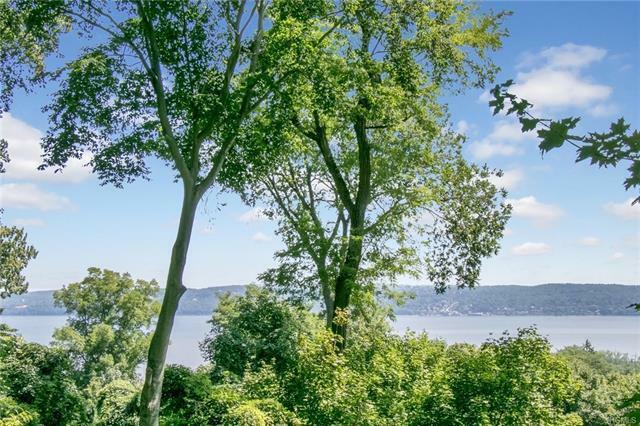 Set on private 1.46 wooded acres & 10 min walk to village of Piermont & NYC transportation. Home being offered "as is" & sold WITHOUT certificate of occupancy. Sewer hook up to property just completed. House partially gutted including baths & kitchen. Buyer will need to apply for c of o after closing for all renovations, including electrical work. Owner will offer financing with lg down payment. Add&apos;l notes: Tweed Blvd in Piermont is serviced by the Nyack Post Office.